On Saturday, a massive pro-Second Amendment rally took place in Idaho on the steps of the Boise Capitol that drew nearly 2,000 supporters. 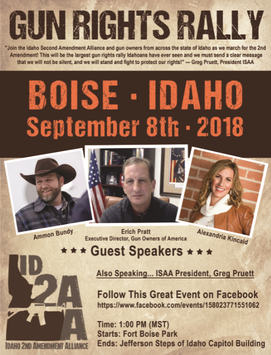 The rally, sponsored by the Idaho Second Amendment Alliance (ISAA), was not the first the organization has put on but seems to have been the most successful up to this point. Among the speakers at the rally were Ammon Bundy, Erich Pratt of Gun Owners of America, and attorney Alexandria Kincaid, who is a strong Second Amendment advocate and has written numerous bills for ISAA. Idaho is known as one of the most gun friendly states in the Union, but these folks want to be sure to keep it that way. It was discussed that nearby states have also been known previously as “gun-friendly” states, such as California, Oregon, and Washington. They have lost that distinction through apathy from the citizens. The major concerns raised by the speakers included ‘red flag laws’, or Gun Confiscation Orders — that will allow the police to take guns from those who have committed no crimes. The second amendment has been under siege by gun control advocates throughout the country, and even Idaho had a group of gun-grabbers at a rally this past Spring. However, this rally in favor of individual gun rights is believed to have drawn one of the largest crowds in Idaho history. If you have fallen asleep just because the team with “R” on their jersey are in power in Washington, it’s time you woke up. The attacks on your God-given rights to keep and bear arms are greater now than they were when Barack Hussein Obama Soetoro Sobarkah usurped the people’s White House. Good for Idaho for being vigilant during this time! Tim Brown is an author and Editor at FreedomOutpost.com, SonsOfLibertyMedia.com, GunsInTheNews.com and TheWashingtonStandard.com. He is husband to his “more precious than rubies” wife, father of 10 “mighty arrows”, jack of all trades, Christian and lover of liberty. He resides in the U.S. occupied Great State of South Carolina.